The Nissan Leaf is probably the best electric car on the market today. Besides its limited range, the only thing that raised criticism in it was its price, but that’s no longer true. Nissan unveiled a substantially upgraded Leaf for 2013, first in Japan, and then in the U.S. (with local production) but it will take a few more months before that updated model reaches Europe. And that is not good news for European customers, because the new Leaf didn’t only got better with new tech, it also got a lower price. With information about the cheaper Leaf in Japan and America known everywhere in Europe (thanks the Internet), Nissan had no choice but to react immediately, which it did. 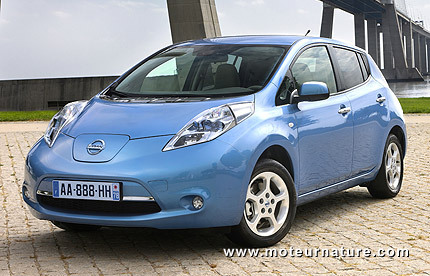 Nissan lowered the Leaf’s price by 3,000 euros. That is effective today, and without any change to the car. The base 2013 Leaf in America is cheaper by $6,600 because Nissan removed the navigation system but this equipment remains standard in Europe. Nissan Leaf was €35,990 last week in France, it’s down to €32,990 today. With the government cash incentive for buying an EV, customers will now be able to get a new Leaf for €25,990. Nice! And there’s more to come with the upgraded model scheduled for this summer.